We recently drove the new Ford FreeStyle, a Compact Utility Vehicle or CUV, at a media drive event. 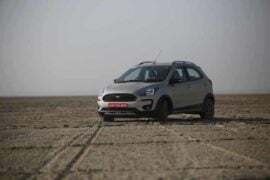 The drive was organized in Jaipur where we drove this car from Jaipur City to the Sambhar Salt Flats which is around 100 Km from the city. 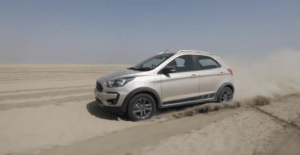 We tested the car on city roads, highways as well as the salt flats. In this review, we share with you our experience behind the wheels of this car and whether or not you should consider this car. 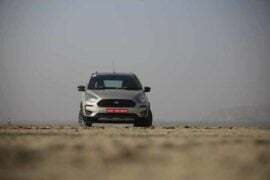 Let us get started with the Ford FreeStyle Review. Ford FreeStyle- What Is It? Let us start with the very basics. Where does Ford Freestyle fit in terms of body style and size? Well, if you ask me, it is a car placed between the premium hatchbacks and compact SUVs, both in terms of size as well as characteristics. 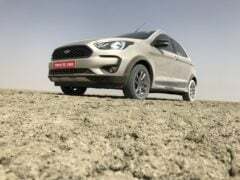 It is a sub-4 meter car with high ground clearance, an SUV like suspension and very well tuned suspension. In terms of aesthetics, it has a very masculine styling and does resemble its younger sibling, the Figo hatchback. 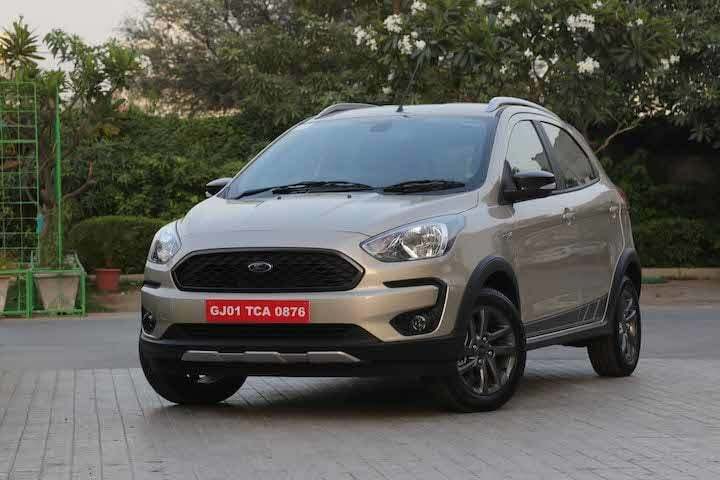 It is smaller than the larger sibling Ford EcoSport, but it does possess very sporty characteristics and go anywhere attitude. The exteriors of the Ford FreeStyle are very sporty. The car gets an aggressive front with a honeycomb-like 3D design grille with the blue oval Ford Logo in the middle. The bumper below is large and has a small lower grille, dual tone colour treatment as well as a scuff plate to make it look more appealing. The headlamps are large and chunky. The fog lamps housing is also quite attractive with C-Shape design. It does not have the DRLs though. On the side, it gets familiar Figo-like profile but with side cladding and graphics on the side doors. The body lines running on the side of the car, blackened pillars as well as black outside rear view mirror all add to the sporty appeal of the car. On the rear as well, there is dual tone bumper with integrated scuff plate design and C-Shaped black inserts. It also gets a rear windshield washer, wiper and defogger. 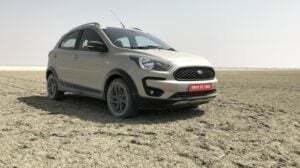 Although there are many visual similarities with the Ford Figo yet the car is very different both in terms of visual appeal as well as the stance. On the inside, the Ford FreeStyle is also quite plush and premium. You can easily identify the Ford design elements with a very familiar steering design, similar air-con controls as you find on the Figo, similar infotainment unit as Ford EcoSport and so on. The Infotainment unit here is quite impressive as it comes with a 6.5-inch high-resolution touchscreen system with support for Apple Car Play and Android Auto as standard. There are also 2 USB ports and a 12V standard charging port provided. 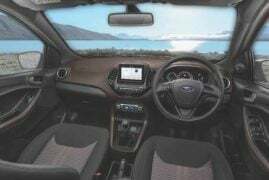 The dashboard design is also dual tone and the cabin feels quite good in quality and choice of materials. The rear seat is also quite comfortable with good legroom and headroom. It is quite comfortable for 2 passengers at the rear, a third one may be a slight squeeze because of limited shoulder room. The automatic climate control system works beautifully and cools the cabin very effectively. In the dry heat of Rajasthan, we did not face any comfort issue inside the car as it cooled the cabin quite well. 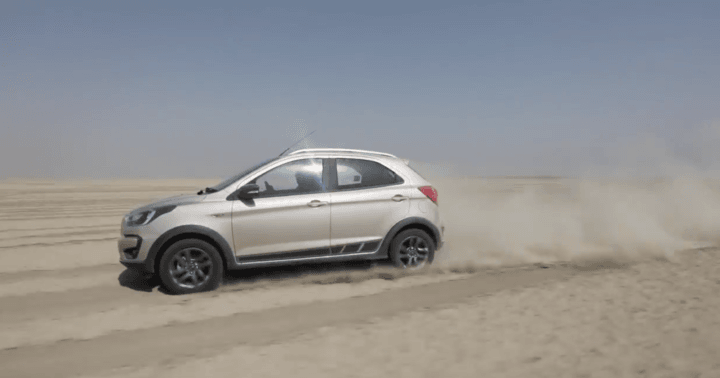 When it comes to ride-and-handling, Ford FreeStyle is yet another Ford. It has excellent handling and steering feedback. If you like driving, you will certainly like this car. The suspension is slightly on the stiffer side, hence it is not a butter smooth ride, but at the same time, the handling is excellent. 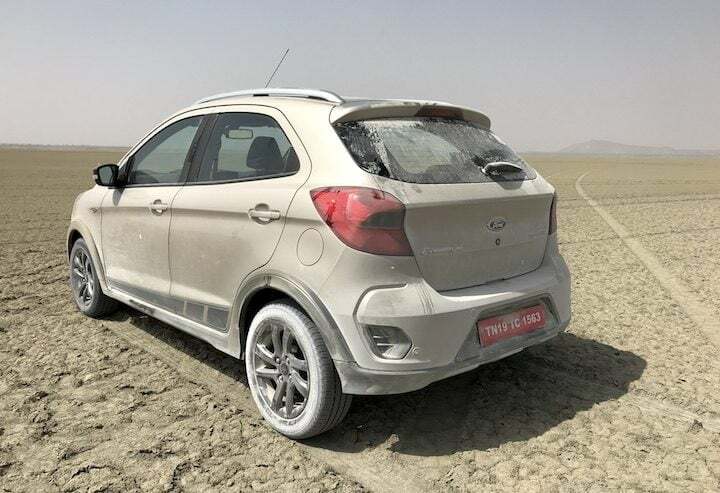 The car does soak over most of the bad roads and bumps with ease, but you get some of that seep into the cabin owing to slightly stiff suspension. The upside is that it feels very confident around corners, at high speeds as well as when making a quick lane change. 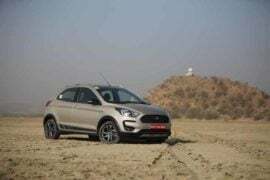 The braking is also quite good and overall, the large tyres, high ground clearance, a well-tuned suspension and tall stance make it a delightful car to drive. The variant we drove was top of the line Petrol manual transmission version with a 1.2 Litre naturally aspirated petrol motor. 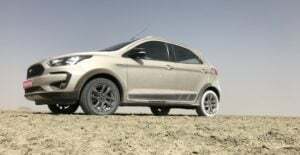 There is also a 1.5 Diesel motor on the offer which is presently used on the Figo and Aspire as well. The 1.2 Litre petrol engine is based on the new 1.5 Litre Petrol unit found in the EcoSport. This 1.2-litre unit produces an impressive 96 PS of peak power and 120 Nm of torque. This engine is quite linear in terms of power delivery. Also, the gearbox used on this car is a newer generation transmission unit with a 5-speed manual gearbox. It has a very smooth operation, notchy feel and short throw gear shifter which feel quite sporty to use. The engine is happy revving and does feel sufficiently powered to pull the car. 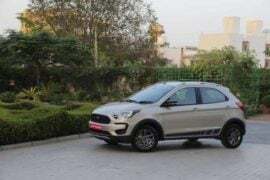 The claimed mileage of the Ford FreeStyle is 19 KMPL. In real-world, depending on your driving style, you can expect a mileage of 14 to 18 KMPL. Ford FreeStyle is a very interesting package. 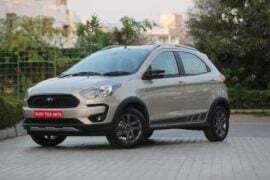 It is a car for those who either don’t have space to park a compact SUV (or SUV) or budget to buy a compact SUV but still want a car which can go places where a regular small car can’t go like rough terrains and bad roads. 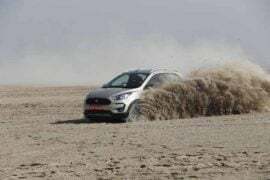 The SUV like attributes of FreeStyle make it a really free-spirited car and it does reflect well on its driving experience and handling manners. The gadgetry and features on the FreeStyle are also very loaded which make it a no-compromise car. If I have to nitpick about it, I can count the missing dead-pedal and LED DRLs which are not offered on the car, but none of these two is a deal breaker for me. Overall, we really enjoyed behind the wheels of the car, it was fun, spirited and safe at the same time. Loaded with convenience features, Ford FreeStyle is a worthy Compact Utility Vehicle.